Spirit of Atlanta has undergone a wealth of changes recently that have reworked the corps' image and management structure. While some changes bring in the new, other changes involve a return to the old and familiar. DCI.org caught up with Executive Director Joel Vincent, Director of Education and Programming Mark Waymire and newly appointed Corps Director Todd Snead to find out what's new for the first time and what's new once again for the corps. 1. Why did the corps move back to Atlanta? Todd Snead: First, Atlanta is where the corps was founded and it seemed time for the organization to reconnect with its roots and strong alumni base in and around the city. Second, Atlanta is a vibrant city that offers multiple opportunities for the corps to develop educational, service, and entertainment partnerships with a variety of organizations and institutions. 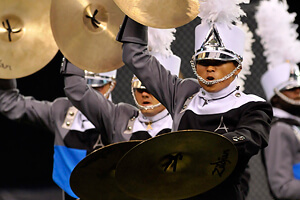 Third, there is a wealth of talent—both in terms of teachers and students—in the Atlanta area that are interested in the drum corps activity. We wanted to provide a world-class experience for those individuals in the Southeast without the need for them to travel a great distance. 2. Why did the corps announce that it would change its name back to Spirit of Atlanta? TS: The official name of the corps was changed back to Spirit of Atlanta because we felt it important to re-establish our role as cultural ambassadors of the city. 3. Does the name change reflect a return to the Southern identity the corps had in its early days? Mark Waymire: If one closely examines the corps' early history, there were some design connections to the South, but not wholly nor exclusively. Most of the corps' "classic" repertoire from that era was based on the corps' Georgia roots specifically and not necessarily "southern" roots. It was more the corps' attitude, its sound, and blues and jazz as source materials that formed its identity. It seems that because Spirit was the "big southern corps," perhaps whatever Spirit choose to do was then deemed "Southern." Our current design team refers to the "old" Spirit attitude as "Spirit Sultry." Though several corps hint at blues and jazz on rare occasion, such is done while staying within the confines of what is currently being rewarded and what can be executed at the highest levels. We must design for drum corps fans and judges in 2011. We are constantly thinking about the corps' past successes and its identity, probably more than any other topic. Will Spirit 2011 reflect the design team's respect of the corps past and view of "Spirit Sultry"? Absolutely. 4. Looking back, was last season's production "Forging An Icon" a precursor of the corps returning to its identity, perhaps a reminder of what the corps was and what it will be again? MW: It was a great show designed to honor one of the most recognizable icons of the activity. It also, to some degree, reflected our move to Atlanta. 5. Does the corps still have ties with Jacksonville State University? Joel Vincent: Both organizations still enjoy a rich and meaningful relationship through close ties with the music department and many JSU corps members. Corps founder Freddy Martin attended college at JSU and the corps rehearsed there on and off since 1977. The official move to JSU in 2001 came at a time when the corps was in need of some assistance and the university was willing to reach out to a long time campus "visitor" and make the organization an official member of the university. The faculty, staff, students, and administration of JSU, along with the city of Jacksonville, were fantastic hosts for many years and we are very grateful to have spent quality time there. Although our "formal" relationship with the university ended, we want our connection to the welcoming JSU community to continue well into the future. 6. What does the move and name change mean for recruiting? Is it much easier to get into Atlanta than Jacksonville? TS: We have found the name change has had an extremely positive effect on recruitment and re-establishing alumni connections. When we announced the name change at our Kick-Off Party in October, the applause continued for five minutes. Members who will be aging out in 2011 are extremely proud to be aging out with Sprit of Atlanta, and many of our alumni and fans are excited to once again hear "Spirit of Atlanta" over the speakers at shows. People have been essentially coming out of the woodwork showing their support and excitement for the corps this season and we are glad to provide this experience for those individuals. Jacksonville was conveniently located halfway between the Atlanta and Birmingham airports, but yes, it is easier to shuttle people from the Atlanta airport to local schools than to drive an hour and a half to Jacksonville. 7. What are you doing new for recruiting and training? Are you bringing in a lot of new instructors? If so, what are their other corps experiences that they will bring to the corps? TS: We have considerably increased our recruiting efforts for the 2011 season. Staff and members have been giving recruitment presentations at high schools and colleges throughout the fall, our website has been completely re-designed and made more user friendly, we have developed (and have made plans to develop even more) digital media to be posted on our site and on the DCI Fan Network, and we have increased the amount of information being broadcast on our Facebook fan page and other social networking systems. Much of the 2010 staff has returned for another season at SOA and we are extremely happy to welcome truly outstanding staff with exceptional drum corps experience like Scott Koter, Chris Hestin, Chad Heiny, and Omar Carmenates, adding successful experiences (at corps such as Glassmen, Boston Crusaders, the Cavaliers and others) and professionalism to what was already a great staff. 8. Serving as the brass co-caption head for the last two years, why was Todd promoted to corps director position? Is there a message to the drum corps community in that or was he just the best person for the job? JV: As we have increased our efforts in all areas of the organization, it was time to add an administrative position that could help with the many tasks required of a corps that is aggressively moving forward. Todd has been a valuable member of our instructional staff for the past two seasons and has contributed many positive ideas while being a great leader with exceptional teaching skills. Todd lives in Atlanta and has developed strong professional relationships with music educators and nonprofit arts education organizations in the area. His love for the corps and members, along with his tremendous desire to see the organization be the best it can be, were all strong factors in the decision. He has already had a positive impact on the organization in the few short weeks he has held the position. 9. What are Joel's Executive Director duties as compared with Todd's? Is there any overlap between the two? Will he be less involved in the day-to-day operations during the summer and more in the position of oversight of the total organization? TS: As anyone involved in the activity knows, it takes a lot of energy, time and money to operate a drum corps. Joel will continue his role as the Executive Director and, as you say, maintain an "oversight" of the entire organization while I will be tending to the daily activities of the corps and interfacing with staff, members, and the community at large. 10. What are you doing to stimulate additional funding? TS: This is an area in which we are investing a great deal of time and energy. We have already launched two online fundraising campaigns and we will be launching a more long-term campaign in January. We also have been increasing our efforts to acquire additional funding through grant applications. We are very proud to have received a $20,000 Chase Community Giving Grant in September (thanks to overwhelming support on Facebook from our alumni and fans). We will also be working diligently to increase in-kind donations such as food, supplies, and services. I am continually seeking performance opportunities in the area that may generate additional income and we are in the process of developing community partnerships with Atlanta area businesses, schools and organizations to help us strengthen our connections with the community and develop a high level of sustainability for the future. 11. What is being done to promote the corps within the Atlanta community? TS: I have been meeting with alumni, teachers, professors, community-based organizations, and business leaders to let them know we are here and extremely interested in becoming a valued part of this community. We are currently in the process of applying to many of the community's arts councils and arts education registries and hope to develop additional relationships with other arts related organizations in the coming years. In January of 2010, members of our brass staff and brass ensemble presented a brass pedagogy clinic at the Georgia Music Educators Association annual conference and convention. In March 2010, a select performance ensemble provided live music for the Healthcare Information and Management Systems Society annual conference held in downtown Atlanta. Both of these opportunities have helped us establish a meaningful connection with educators and community leaders in Georgia and across the nation. 12. Tell us something about the updating of the corps logo. Why was it changed? MW: As with any organization, corporate business, athletic, or drum corps, there always comes time for updating certain things that are identified with the organization. Our logo change is certainly just that; our famous delta not only in a modern, fresh look, but one that also reflects our move back to Atlanta in that the new delta continues to accentuate the "A" shape. You can also see it clearly on our new uniform.